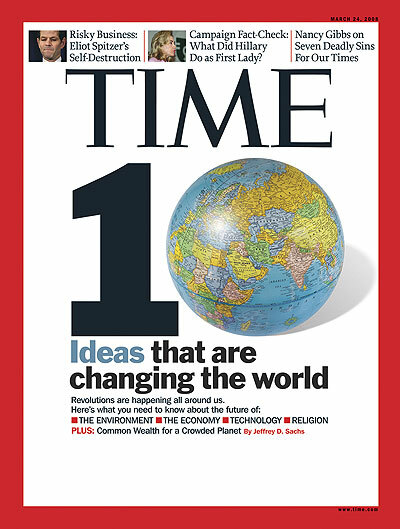 A recent cover feature of Time magazine was “10 Ideas That Are Changing The World”. According to journalist Joel Stein ” ideas are the secret power that this planet runs on”, and guess what? Idea #5 is Kitchen Chemistry. Some are fed up with foams (why does everyone think molecular gastronomy is only about foams anyway? ), but my guess is that scientific approaches in the kitchen will become more and more common in the years to come and I certainly welcome this focus on kitchen chemistry. This paradigm shift won’t be such a big deal in practice. Your oven is pretty much an advanced science gadget already, you use meat thermometers, and that measuring cup looks an awful lot like a beaker. You’re just going to have to step it up a little: replace that liquid-measuring cup with a more accurate dry-weight scale; get a vacuum sealer like that FoodSaver gadget and a Crock-Pot that stays at a precise temperature so you can sous vide meat (which involves cooking it in a bag for a long time in a low-temperature water bath); learn how to use simple chemicals like agar-agar and xanthan gum (just better versions of gelatin and cornstarch, really); review a little high school chemistry. No big deal.